a nice big hole in the sleeve for the main dishes. Kind of appropriate. 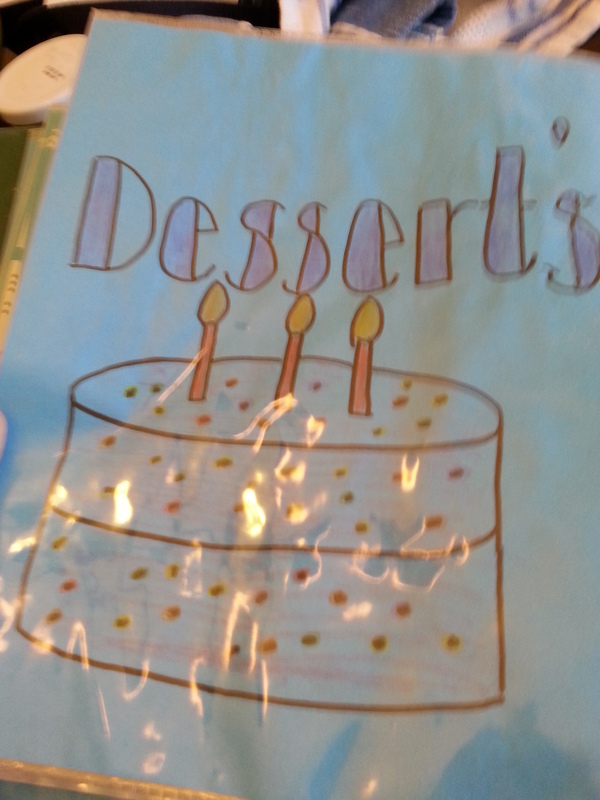 Desserts my favorite section and not a bad drawing! 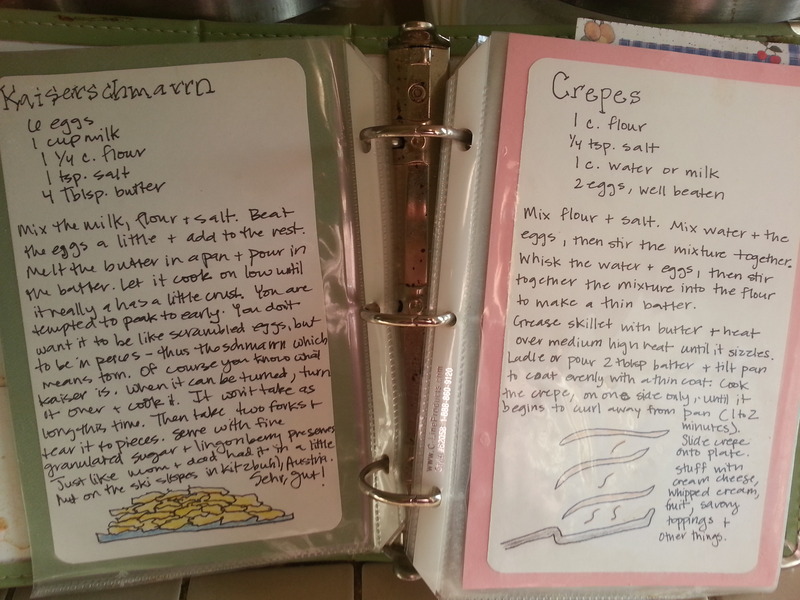 When I was 17 I was heading off to college I wanted to take my mother’s best recipes with me, so I gathered them together into a 3 ring binder on blue paper separated into categories like drinks, bread, salads, desserts. 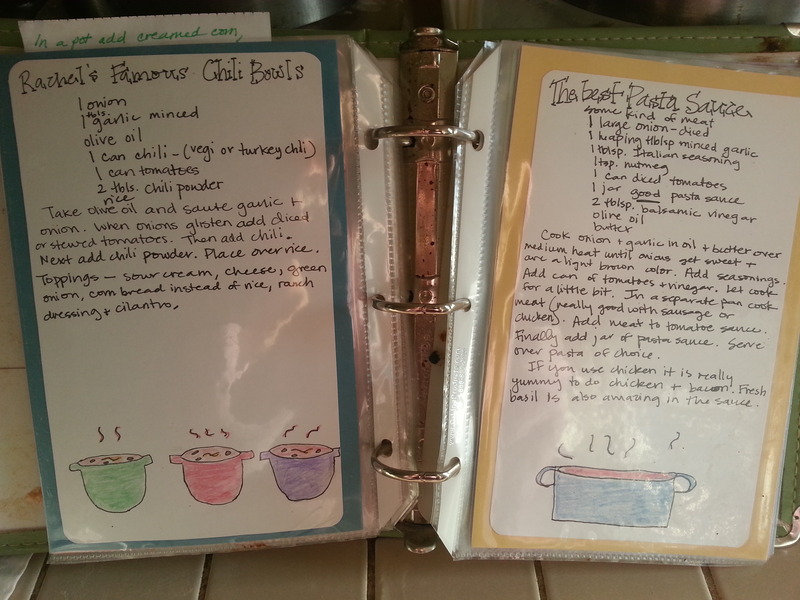 The thing that I love is even though it was just for me I did my own drawings to accompany the recipes. How many 17 year old’s who can’t really draw to save their life do that? 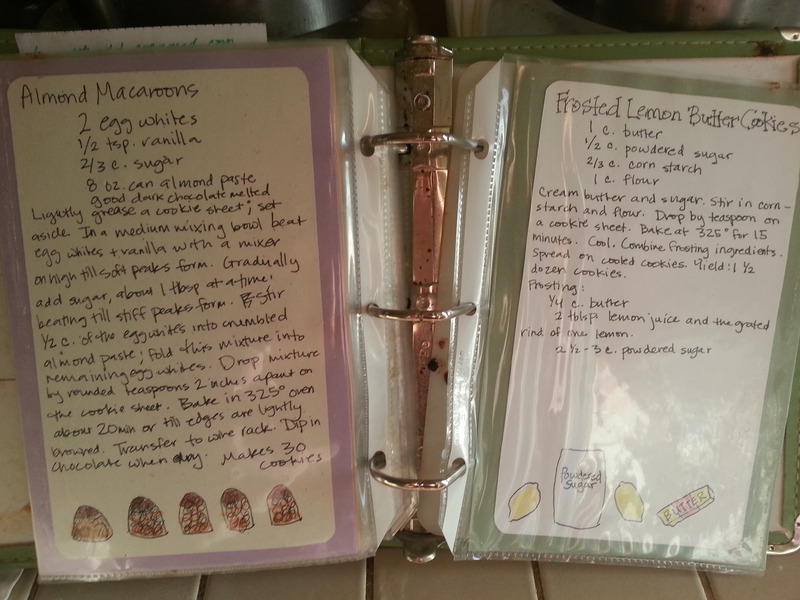 Isn’t it interesting because I could have just written the recipes down. 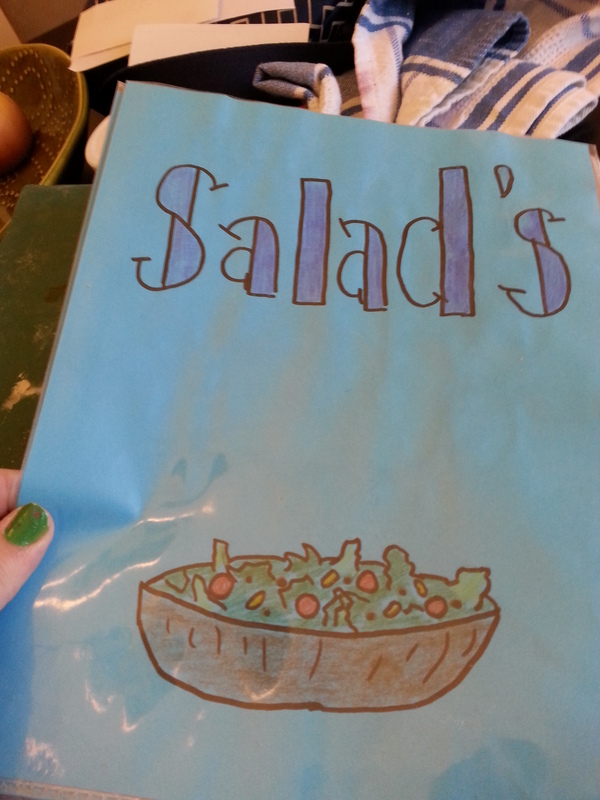 I’m not an artist so why did I feel inspired to add the drawings to my little cookbook? Who knows exactly what inspired me but I would like to think it was because I knew that the recipes were special, that they deserved to be memorialized in some way and even if I was the only one who would see the drawings (which I pretty much am until this post) it was still worth it. And you know what? It has been worth it. 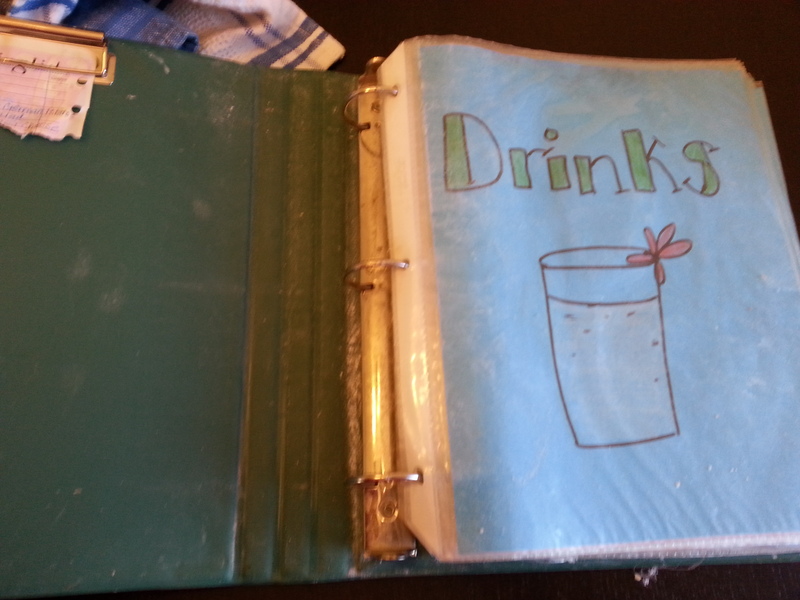 I feel happy whenever I look in my cookbook and see the drawings. It’s like 17 year old me waiving and saying hello to 33 year old me. Over the years flour and guck has built up on the plastic covers of the pages and even had several that got briefly melted but I haven’t changed them to new covers. I like seeing the years and remembering the time I made candy and it melted the on the fudge recipe or seeing the flour and remembering the pancakes that I’ve made over the years. Italian Chicken is one of my favorites. It’s an amazing thing because at the same time that my cookbook brings back all those memories it is creating new one’s that I will look back on 5 years and see the flour from when I first made bread in my new house or the raspberry pies I made and brought to my friends the Porters. I don’t if I can think of anything else that is both a time capsule of past and present more than this cookbook. For some reason I had an idea when I was young that this would be important so I not only made such a book for myself but when my sister got engaged I made a similar (if a bit nicer!) cookbook for her. You see, she and her husband and spent much of their courting time with me and I had done most of the cooking. At the time I was working and it was fun for me to cook for hungry guests and hear about their plans and adventures. 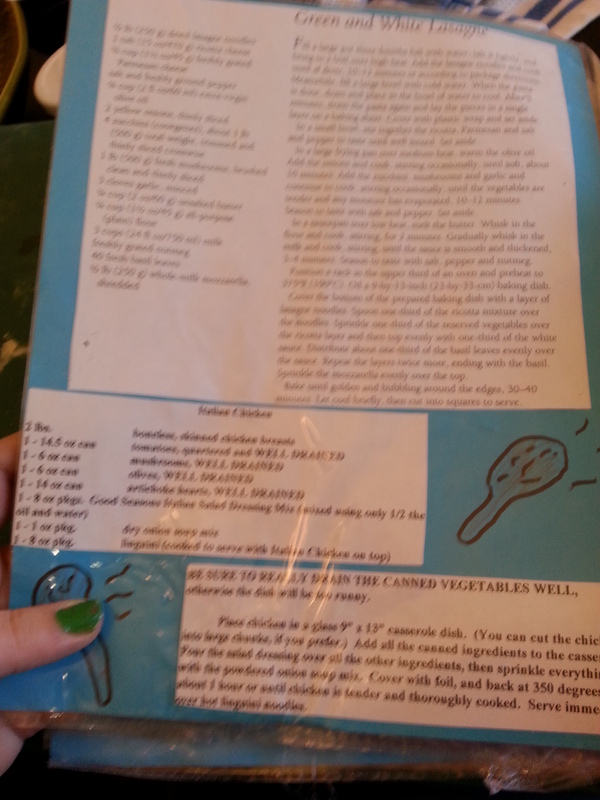 So, when I made Megan a cookbook it was more based on the recipes that I had made for her and not as much about the recipes Mom had made. 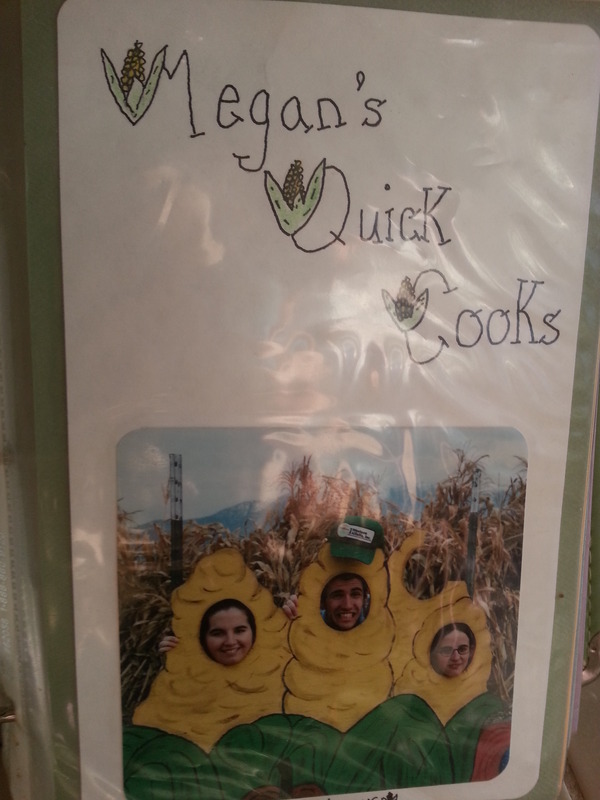 Megan’s recipe was all based on things that were quick that I had made for them as they were courting and engaged. You’ll notice I have hand drawn drawings on Megan’s too. It just makes it more special. Chili was a favorite of mine in college. It was sort of dotored up canned goods but always tasty and cheap. 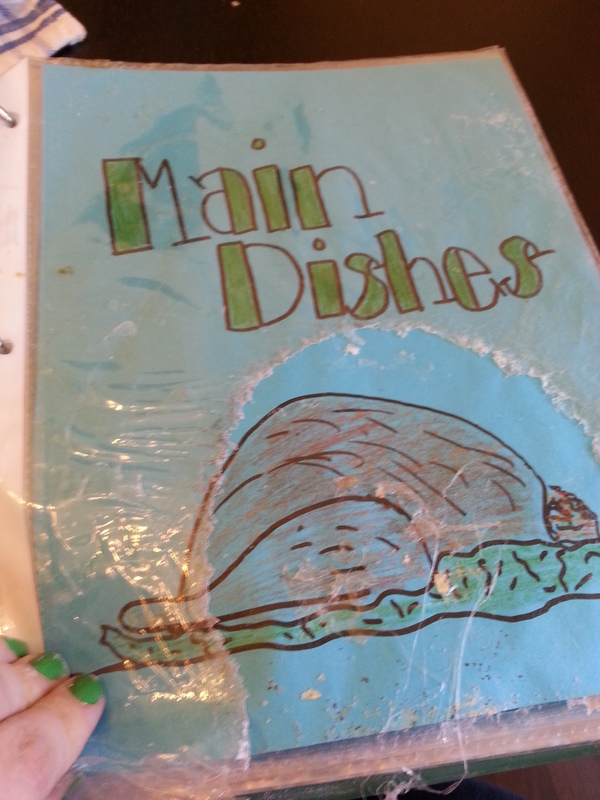 You will see in hers there is also the hand drawn artwork which I still find amazing as I am not much of a drawer but there was something about making a cookbook that made me draw by hand. It’s like passing on a bit of who you are with what you cook so nothing else would work but your own hand at drawing. And maybe the memory of making the drawings becomes part of the time capsule for past and future memories. I hope it has been that for my sister. I know she uses it often. As I was making bread I said to myself ‘I wonder if most people would just look online for such a recipe?’ I’m sure they do and I look online often for sure but I hope that with the advancement we haven’t lost the value of creating family cookbooks, with personal touches of story and art for your life, your family to share and add on to. Such a legacy of flour and egg cannot be transferred to an email or a pinterist pin. Food has such a link to our survival, to what makes us literally alive; therefore, the stories it can tell can be monumental or sublimely small. 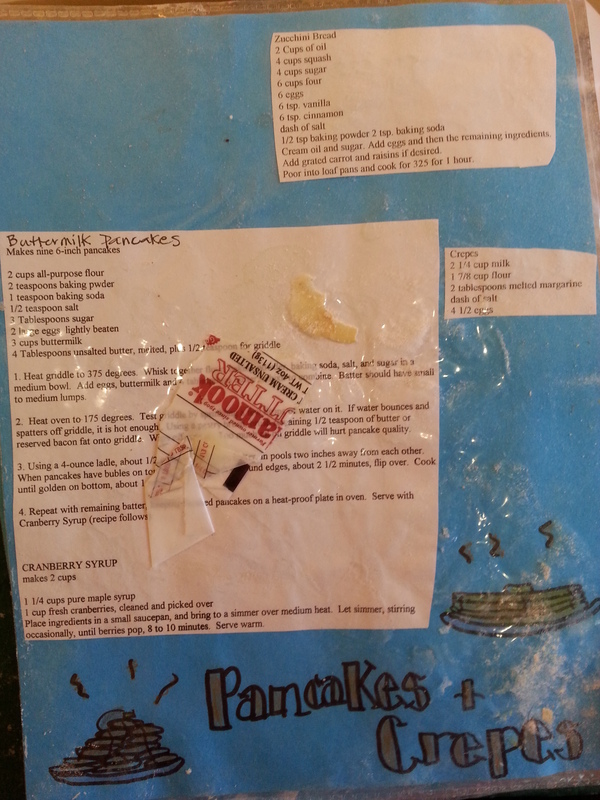 Without the family, homemade cookbook we lose some of those stories and some of that life. So make a goal of it this year to write down your family recipes, add some illustrations (you’ve seen mine, don’t have to be so great) and then give similar gifts to those you love for their memories and by transference now your memories. It’s just a good thing to do! Don’t get so lost in the world of blogging, even food blogging, that you forget to make things that make memories. Writing is powerful but so is art and beauty and cooking, so make a cookbook as a gift to your life! You’ll love it! Ps. I know there are companies that can make it all professional but I would discourage from that. Make it you and everytime you see your wobbly version of a salad or a turkey you will smile and say to yourself ‘thanks 17 me love ya’ and those are the sublime moments of life.